My sister-in-law just returned to England after a lovely two week visit. 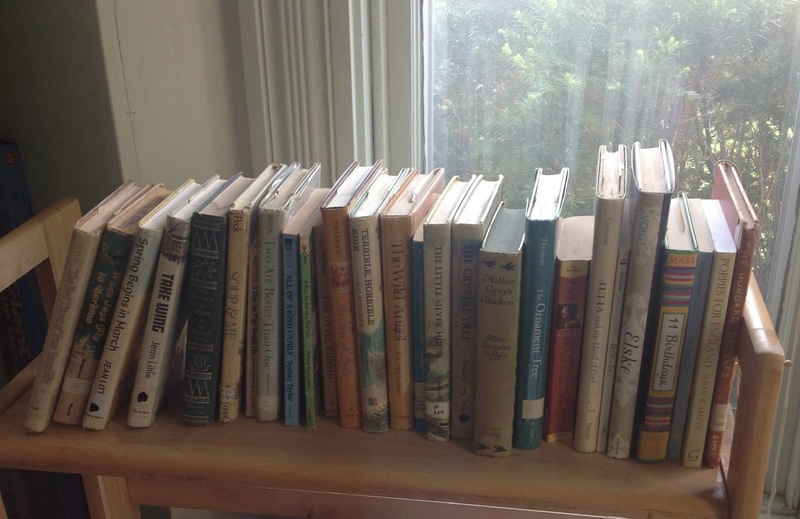 In large part it was lovely because she is a reader (and published writer) of children's books, and I got to do one of the things I love best--browse my shelves and find piles and piles of books for a guest to read! The only bittersweet part of all this book fun was that I had to go to work. I did not get to be a guest too--reading and basking in the sun and resting (whiney whiney whiney). So when my dear boy said his throat was killing him, and could he stay off school on this lovely sunny spring day, I tenderly acquiesced (I'm not feeling that great either...). And though I won't actually get to be a guest for the day (there are Chores to be done), I'm planning on doing a lot of reading. It will be good for my mental health. And I will start reading, after, of course, I carefully put all the books shown above back to their proper places, and restore the lego creations I stashed in the laundry room two weeks ago. Good for you, Charlotte. I was always the girl with perfect attendance until one day in grad school I realized I never missed a day, same in college. Then my sister told me about mental health days and, well, I took one. I also did some chores but also read, napped and enjoyed the day. So enjoy your and remember mental health is as important as physical health and I hope you and your son feel better at the end of the day. I want to read The Little Silver House (sniff). This one is a library book, so it will require Planning...I could bring it down in July, and you could bring it back in August???? Ah, that could work! I will see if I can get it on interlibrary loan here first, if you think I would like it as much as it seems I would. Wow. Amazing the number of books on there that I have read and enjoyed. I, however, don't have copies. I buy very few books, and keep even fewer. Fun to see your shelf, though!